Atlantis Dubai is the first hotel that is built on the 8th wonder of the world The Palm Jumairah, The man made Islands in the Arabian Gulf. It is the first hotel erected at this beautiful and most talked about structure of Dubai. Atlantis has captured the world's imagination with its magnificent scale and ingenuity. From the moment of arrival, you're immersed in a dazzling world of imagination, pleasure and luxury. The resort offers relaxation and thrills for couples and families alike, including a landmark hotel, unique marine habitats, an exhilarating water park, pristine white beaches, world-class cuisine, indulgent spa and cosmopolitan boutiques. To stay or visit is to live out your dreams amidst warm Arabian seas. Following are the major Attractions of the Atlantis. 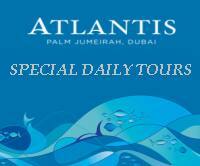 Exotic Dubai Tours and Safaris offer 2 different tours of Atlantis. A maze of underground passageways and tunnels hosting 21 unique and unusual marine exhibits and offering uninterrupted underwater vistas into the boulevards and streets of the ruins of Atlantis The Ambassador Lagoon, containing 11.5 million litres of water, will mesmerise guests with a single ten metre long viewing panel Navigators in each room will guide guests through the individual exhibits, mystical relics and ruins from the ancient City of Atlantis. Join us and marvel at the mythical lost city of Atlantis. 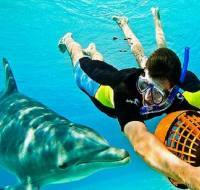 The experience with one of our dolphins will take place in one of the three lagoons. Following the interaction, guests have the opportunity to shower and change in the locker room area. Seven interactive kiosks where guests can learn more about dolphins and marine life conservation, play games and send e-postcards to family and friends. 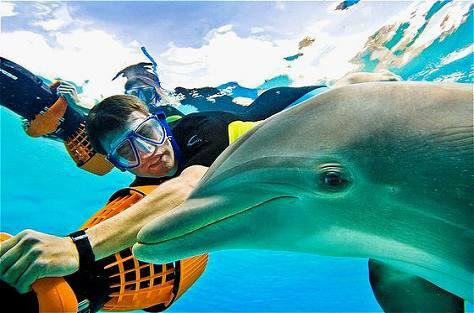 Explore a world of breathtaking water thrills at Aquaventure (Aqua Adventure). Slide down the immense Ziggurat and through a shark-infested lagoon, take a river ride of over two kilometres, ride the water rapids and white water chargers. For a gentler experience, younger visitors can plunge into Splashers, a water playground for kids. It all adds up to a unique water adventure, with something new discovered at every turn.